One of my favorite fictional characters is Austin Powers. In his third movie, he time-traveled forward to the 1970s to battle Dr. Evil and once again save us all. When Austin Powers stepped out of the time machine, he discovered a world seemingly filled with shag carpet, mirror tiles, peace signs and black lights. What he did not find however, (should he have chosen to look) is a pet store selling natural pet food. At the time this movie was set in, Sissy McGill, founder of Solid Gold Pet Foods was on her own secret mission. She traveled to Germany in 1974 to learn why dog breeders from that country seemed to produce more than their share of world champions. What she discovered in Germany was destined to start a revolution in pet nutrition back home. It is important to remember that extruded pet kibble in the United States was regarded as an economical way to get rid of waste ingredients from the human food supply chain. Invented in the 1950s, kibble had improved little by mid-1970s. In contrast to extruded kibble, the best German Dog Breeders tended to used only premium natural ingredients to feed their pets. They supplemented these ingredients with whole grains and herbs that were chosen for their health enhancing qualities. Upon returning to the United States, Sissy began producing the very first “Natural & Holistic” extruded pet kibble utilizing what she discovered about the benefits of good pet nutrition in Germany. Her goal was not to start a revolution, but to simply to help breeders and pet owners make their own dogs healthier. Though there was much resistance at the time, Sissy successfully fought government regulatory bodies for the right to market her pet food as “Natural”. 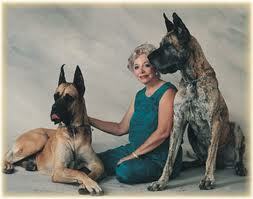 She has continued to fight to make all pet food healthier in the ensuing four decades. Solid Gold Pet Products are just as healthy and natural today as they were back in the 70’s when first beginning the natural food movement for pets. The packaging is an explosion of grooviness; with sparkly colorful packaging that includes electric blue, purple, orange and gold. Yeah baby! Whether your pet is average, overweight, a small or large breed or prone to allergies, Solid Gold has formulated a canned or dry product specifically for your furry four legged family member. In addition to pet food, Solid Gold also makes a line of holistic treats, grooming aids and healthy food supplements to help your pet reach its full genetic potential. 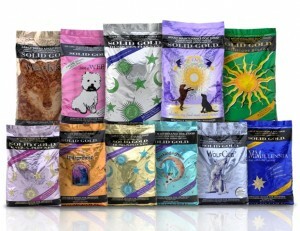 Be an original and try the original holistic pet food in either a unique-grain or grain-free formula . Find a store near you.